I found this Geoskincare Hydrating hand & body cream at TK Maxx. It is made in New Zealand, certified organic and not tested on animals. Also this has a free from list as long as my arm - no phenoxyethanol, sls, parabens, propylene glycol, triethanolamine, isopropyl alcohol, pegs, deas, edtas, mineral oils, petrochemicals, genetically modified ingredients, artificial colours and fragrances. This cream is light and runny, shake the tube and you can hear the product move around. The lotion is certainly ideal for the summer months as it does not feel heavy or sticky on skin. I do wonder how well it would work on my very dry skin during winter. I have mainly been applying this to my body but it works well on hands. 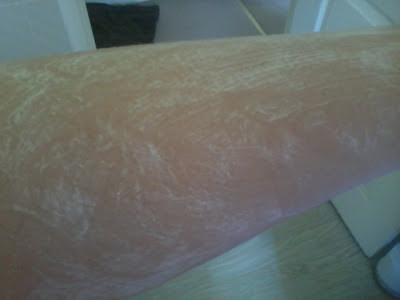 As you initially start to rub into skin it turns you white as illustrated in the picture below but with a bit of effort it disappears. It just takes a few extra minutes compared to other creams I own. It is perfect for those of you who prefer a non greasy hand cream. I can continue typing after applying. The fragrance is from lavender but it does contain ylang ylang and patchouli. It is lightly scented so will not clash with other perfumed products you may apply. After purchasing this product Love Lula announced themselves as a stockist. The hydrating cream is priced at £13.50 for 100ml tube. I paid £7.99 at TK Maxx. Other products in the range include cleansers, toner and moisturisers. I am not sure if I would buy this cream again but I have enjoyed testing and I love the brand's ingredient policy. P.S. Sorry for the ramble - clearly overexcited by coffee and a relatively early start for once! Hi Rachel, thanks for discovering the blog and being excited about it, that makes me smile. I use Organic Surge Moisture Boost shampoo and Giovanni 50/50 conditioner both of which I have reviewed on my blog. I tend not to test much haircare because of my sensitive scalp so since I love these two brands a lot I stick to them. I have been using both for a while now, I have thick, coloured hair. Shedding hair can also be a result of hormones and diet. I loose larger amounts at time of month or if I'm not eating as healthy as I should. Hope that helps? Great review Sarah. This is very similar to the Bently Orgainics lotion I used, how it turns white when rubbing in. I wasn't keen though, I like lotions (especially on my body) to sink straight in. Although I maybe wouldn't have minded if the smell was better!